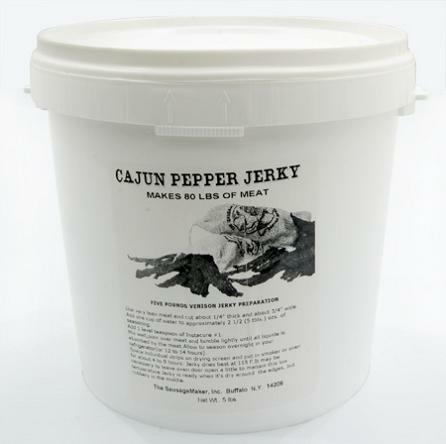 You�re viewing our Sausage Maker Cajun pepper jerky seasoning � makes 80 lbs. Uncle Abe's seasoning adds the traditional Cajun flavor of salt, garlic powder, paprika, onion powder, cayenne pepper, oregano, thyme, and other seasonings with an emphasis on black pepper to flavor venison jerky and other meats. TSM's Cajun seasoning gives a distinct spicy flavor that is a welcome addition to homemade jerky, or use it to season up sausages, chicken, meat patties and more. Contains soy. Directions for use is on each package. Includes Insta Cure� No. 1 (1 lb. per kit). Makes up to 80 lbs. of flavorful jerky. 5 lbs. We have answers to any questions you may have about our products. 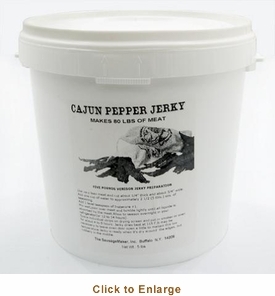 Scroll down to view our Sausage Maker Cajun pepper jerky seasoning � makes 80 lbs.